As part of a gradual process of descent, the larynx moves from the level of the second and third vertebrae (fetus) to the level of the fourth vertebrae (birth) to the ﬁfth vertebrae at 6 years of age and to the level of the seventh vertebrae by puberty. High positioned larynx is a normal variant of the pediatric larynx and high-rising tubular epiglottis may present with intermittent foreign body sensation in throat in such patients,  It is, however, rare to identify such visible or high-rising epiglottis on routine oral examination in adult patients without upper respiratory tract inflammation. 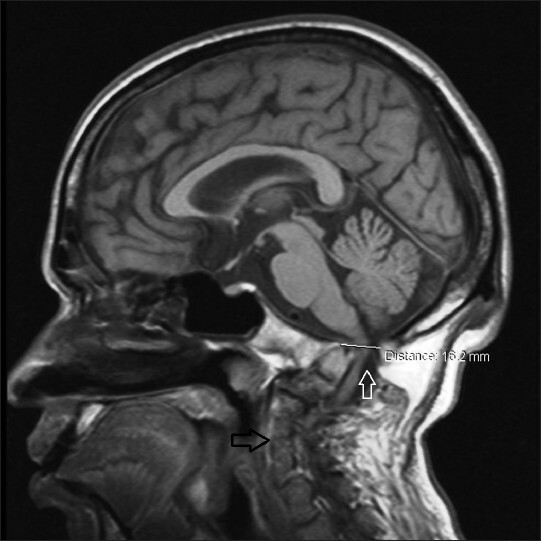 The aim of this case report is to describe a rare and unusual clinical association of short neck and high-rising epiglottis in an adult male, who based on additional clinical and imaging evidence, was diagnosed with Klippel-Feil syndrome More Details (KFS). Maurice Klippel and Andre Feil first described the syndrome in 1912, characterized by patients with Feil's Triad (low posterior hair line, short neck, limitation of head and neck movements or decreased range of motion in cervical spine). This classic presentation present in less than 50% of patients with KFS. KFS is characterized by congenital vertebral fusion believed to result from failure of normal segmentation of the cervical vertebrae or somite between 3 rd and 8 th weeks of fetal development (rather than a secondary fusion). KFS appears to be a heterogeneous disease often associated with craniofacial malformation. KFS has been associated with a broad spectrum of developmental anomalies ranging from mild cosmetic deformity to severe disability. The present case report under discussion is remarkable for unusual clinical findings like High-rising epiglottis, multiple cranial nerve palsies and imaging evidence of foramen magnum stenosis, anomalies that are not reported previously in association with KFS. 1. Bruce B. Congenital disorders of the larynx. In: Cummings CW, Schuller DE, Krause CJ, editors. Paediatric otolaryngology-head and neck surgery, 3rd ed. St Louis, Baltimore: Mosby; 1998. 2. 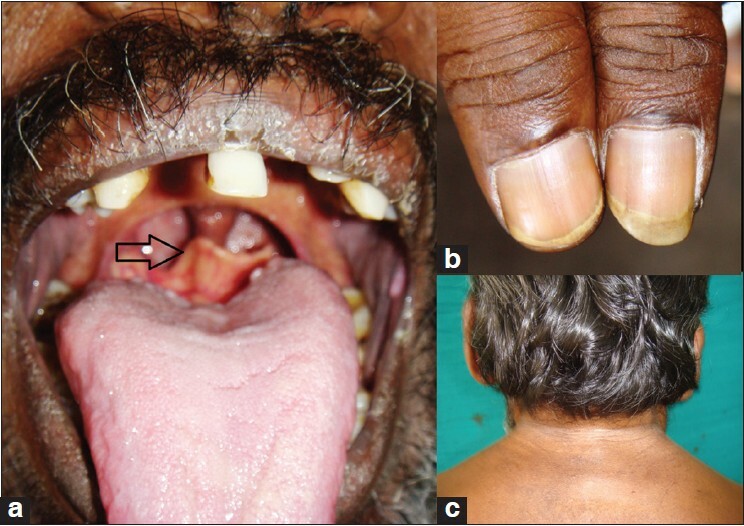 Petkar N, Georgalas C, Bhattacharyya A. High-rising epiglottis in children: Should it cause concern? J Am Board Fam Med 2007;20:495-6. 3. Klippel M, Feil A. Anomalie de la colonne vertebralepar l'absence des vertebres cervicales: Cage thoracique remontantjusqu'a la base du crane. Bull Hem Soc Anat Paris 1912;87:185-8. 4. Kaplan KM, Spivak JM, Bendo JA. Embryology of the spine and associated congenital abnormalities. Spine J 2005;5:564-76. 5. Clarke RA, Singh S, McKenzie H, Kearsley JH, Yip MY. Familial Klippel-Feilsyndrome and paracentric inversion inv(8)(q22.2q23.3). Am J Hum Genet 1995;57:1364-70. 6. Samartzis DD, Herman J, Lubicky JP, Shen FH. Classification of congenitally fused cervical patterns in Klippel-Feil patients: Epidemiology and role in the development of cervical spine-related symptoms. Spine (Phila Pa 1976) 2006;31:E798-804. 7. Rasmussen P. Persistent mirror movements: A clinical study of 17 children, adolescents and young adults. Dev Med Child Neurol 1993;35:699-707. 8. 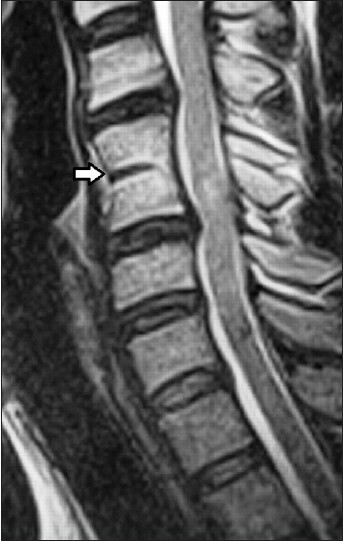 Vaidyanathan S, Hughes PL, Soni BM, Singh G, Sett P. Klippel-Feil syndrome-the risk of cervical spinal cord injury: A case report. BMC Fam Pract 2002;3:6. 9. Elster AD. Quadriplegia after minor trauma in the Klippel-Feil syndrome: A case report and review of the literature. J Bone Joint Surg Am 1984;66A:1473-4. 10. Shirasaki N, Okada K, Oka S. Cervical myelopathy in patients with congenital block vertebrae. Eur Spine J 1993;2:46-50.